Despite continued high unemployment numbers, companies are hiring. Surprisingly, they are finding it difficult to find just the right people for positions that they need to fill. Recruiters, often called “headhunters,” who took a huge hit when the economy tanked in 2008, are reporting that they are now busier than they have been in several years. Working with a recruiter can be a great benefit in your job hunt, but only if you understand their role in the hiring process. Unfortunately, too many people have misconceptions about what they do, and how to motivate them to be your advocate. It’s time to clear the air and bust some of the myths. FACT: Recruiters work for employers, not job hunters. Their job is to find the best talent for the position the employer is seeking to fill, bearing in mind all of the employer’s “must haves,” “should haves,” and “shouldn’t haves.” They aren’t paid to help people to transition to new fields, but rather to find talented individuals who have done the job already in a different context, or people ready to move up to the next level in their same career path. To be sure, they help individuals whom they are able to place, but their primary responsibility is not to be a career counselor or coach for job seekers. Contingency recruiting companies aren’t paid unless their client company hires a candidate they submit. Competition among firms is intense. For individual contributor-type positions, employers will frequently offer multiple recruiters the opportunity to work on the same job posting, and only pay a fee to the recruiter who actually finds the right talent. That said, many contingency recruiters form networks or alliances to cooperate with each other and do “splits” where they share job listings with one side, taking 50 percent of the commission for getting the listing and another side taking 50 percent for finding the successful candidate. This is much akin to realtors sharing commissions for the sale of a home. If a recruiter advertises a search for “my client,” but doesn’t include the name of the client, it is likely a contingency search. Retained search firms are paid by a company to take on an exclusive role in a given search, with the understanding that they will receive a higher level of service and more complete candidate vetting than is typically the case with contingency firms. These firms are most often utilized for executive level searches. Fees earned for retained searches are generally much higher than for contingency searches, and are paid out at specific points in the search process. FACT: Recruiters, like anyone else with very limited time, prioritize who that time is worth speaking with, and for how long. They are likely to be very responsive to clients or potential clients who have job orders for them to fill, and people who they see as strong (potential) candidates for those job orders. They are likely to be much less responsive to individuals who approach them out of a sense of desperation, with a career change in mind, or who are not perceived as “A” class workers. Most recruiters simply don’t have the time to respond to the hundreds of unsolicited resumes or phone calls that they receive virtually every week. And it simply is not their role to coach people who aren’t a close fit for the kinds of positions with which they work. It is common for a recruiter to make 50 to 100 phone calls each day, and with that kind of volume they simply don’t have the time to deal with extraneous conversations. FACT: In almost every situation, recruiting fees are pegged as a percentage of the new hire’s first year base salary. The more you earn, the more they earn. Often they have inside information about what the company is willing to pay, and are able to obtain a higher salary than what a job hunter initially thought they could get. Companies do not take the recruiter’s commission out of the new hire’s compensation. Much more often they understand that they must pay a premium for candidates sourced through recruiters. FACT: Recruiters are essentially in a relationship-building business. The successful ones know that their long-term success is based on building their network of relationships. They remember who helps them on one search, and will be likely to want to aid that person later on. They appreciate when a job hunter isn’t a good fit for a current job, but goes out of their way to introduce them to someone who will be. They love the repeat business that comes from gaining multiple job orders from the same company. One surefire way to get a recruiter’s attention and build a long-term relationship with them is to offer to provide the names of people who are strong connectors to others, thought leaders, and high performers in their specialized field. Not every job hunter will find success working with a headhunter, but if you are accomplished in your field and committed to staying in it, building relationships with recruiters who specialize in your skill set and industry will be a great asset in your job hunt. Public sector general insurer New India Assurance is likely to post 18-20 per cent gross premium growth in the current financial year, after reaching Rs 10,000 crore mark last fiscal, a top company official said today. “We will maintain our leadership position. We hope to see 18-20 per cent growth in premium in the current financial year, in line with the industry growth projections,” company’s Chairman and Managing Director (officiating) A R Sekar told reporters here. “We have not seen losses from foreign operations…it should be a profitable growth,” Sekar said. The largest general insurer had reported a loss of Rs 412 crore for the first time since its inception in 2010-11 on account of around Rs 300 crore losses from foreign operations. However, the company swiftly swung back the very next fiscal (2011-12) with Rs 179.4 crore profit. On growth in various segments, Sekar said, “Both corporate and retail segments are witnessing sound growth rates. But, growth in retail is higher than other segments”. Any general insurance player who would like to see rise in profit has to concentrate on retail segment, he said. About hike in premium in health, fire and motor insurance, Sekar said any rise is consumer-specific, which depends on the risk attached. “I can’t give a number across the board. It depends on the individual policy and risk attached to it,” Sekar said. New India reached a gross premium collection of Rs 10,074 crore in FY2011-12. While Rs 8,543 crore was from domestic operations, Rs 1,531 crore came from overseas operations. It had posted a profit of Rs 179.4 crore during the last fiscal. Maruti Suzuki has given its workers a front-loaded three-year wage increase of up to 75%. It has also decided to dump its practice of hiring contract workers through contractors. Instead, it would hire workers through its own HR department. While up to 15% of the workers would still be temporary hands, they would be paid on par with the permanent staff, to eliminate complaints about wage discrimination. While Maruti’s own cost per contract worker might not have been all that different from its cost per permanent worker, what the contractor paid his workers was significantly lower, going by worker accounts after the recent violent incident at Manesar. This was a major factor in the buildup of worker resentment that finally culminated in violence. We welcome the change of tack at the Maruti management and the new direction of engaging with labour At the same time, it is very important that workers and unions do not draw the conclusion that violence is the only language that managements understand. If such a message gets around, the result would be disastrous. Industry needs a new compact with labor The old-school mentality of seeing labour only as a necessary evil, a cost to be kept as low as possible, regardless of what it means for their living standards and morale, is a short term view on par with shipping a consignment of shoddy goods to make some extra money on one export order. Labour is, at the level of the individual plant, a source of productivity and creativity, and, at the level of the economy, a source of demand for industry’s produce. Lowly paid labour with low morale does little good for individual enterprises or for aggregate demand economy-wide. The point is to put in place managerial practices and incentives to align workers’ interests with those of the enterprise as a whole. For this, managements have to be proactive and imaginative. It is futile to rely upon ability to put down, using force if required, any show of resistance by workers. It makes far more sense to tap people’s innate creativity at the workplace, both to make them happy and add to productivity. Finance Minister P Chidambaram on Wednesday held a meeting with Insurance Regulatory and Development Authority (IRDA) chairman J Hari Narayan to resolve issues in the insurance sector and spur insurance penetration. “The meeting discussed how to increase insurance penetration, how insurance companies can do more business, how better products can be introduced at lower premium, and how more investment can flow to infrastructure sector,” said financial services secretary DK Mittal. Mittal said there will be another round of meeting to discuss investment and taxation issues. The government is looking to popularise insurance and mutual funds to wean investors away from gold and raise long-term funds for investors. A government official familiar with the deliberations told ET that insurance regulator has agreed to develop a mechanism for faster approval of insurance policies. “But the ‘use and file’ process will only be applicable for standard products and the insurers will also have to explain the product mechanism before hand,” he said. At present, insurers can introduce products only after obtaining the sector regulator’s approval. Ways to relax investment norms to channelise more funds into the infrastructure sector, bancassurance and process of approval for opening offices in Tier-II and below towns were among the issues discussed. Exemption of service tax on insurance policies, especially annuities, will be among the key issues that will be discussed on Thursday, another official said. The policies currently attract a service tax of 3 per cent. Finance ministry will also discuss with IRDA a proposal to allow insurance companies to invest up to 50 per cent of their debt investments in AA-rated paper, as opposed to the current stipulation that they invest 75 per cent of their debt corpus in AAA-rated bonds. At present, 50 per cent of the total investible funds of insurance companies have to be parked in government funds. It has now been proposed that this allocation be lowered to 40 per cent. Finance ministry officials and IRDA are also expected to deliberate dilution in the 18 per cent minimum alternate tax, or MAT, applicable to non-life insurers. According to estimates, the investment corpus with life insurance companies is about Rs 13 lakh crore. Of this, only 20 per cent currently goes towards the infrastructure sector. India needs about a trillion-dollar investment in the infra space during the 12th Five-Year Plan (2012-17). 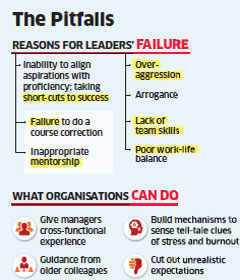 Blinded by past glory, a regional head for a consumer durable company in his mid-30s refused to keep pace with his organisation’s new demands and changed set of performance metrics. He had built the business to a respectable level, but failed to realize that the definition of money had changed from sales to profit. He was unable to realign himself, and lost his job two months ago. The failure to identify one’s core competence can lead to an early crash-out. 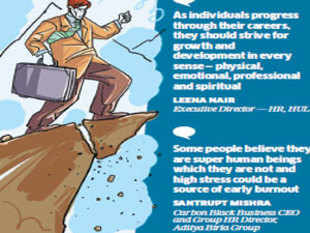 “Be aware of one’s strengths and weaknesses and focus on using the strengths,” says Rajeev Dubey, president group HR, corporate services and after-market, Mahindra & Mahindra. Jain cites the case a hugely successful global manager and CEO of a multinational consulting company, who decided to take on the role of the CEO of a operations company in the business of manufacturing and marketing. “He was brilliant in strategising but when it came to giving directions in operations to a larger workforce he failed,” says Jain. Former State Bank of India chairman OP Bhatt has been appointed on a panel that will assist in the search for the next chief of Insurance Regulatory and Development Authority, a move that signals Bhatt’s return to the establishment. Bhatt was at odds with the Reserve Bank of India on several issues when he headed the country’s largest lender from 2006 to 2011, but with the change of guard at North Block, he seems to be back in favour. “The finance minister himself has approved Bhatt’s name for the panel,” a finance ministry official said requesting anonymity. Although Irda chairman J Hari Narayan is due to retire in February, the government is keen to start the succession process early. Besides Bhatt, former Sebi chairman GN Bajpai,financial services secretary DK Mittal, department of economic affairs secretary Arvind Mayaram and secretary in the department of personnel and training PK Mishra have been named on the panel. Former chairman of Life Insurance Corporation TS Vijayan is said to be the front runner for the post of Irda chief. Vijayan, who was battling corruption allegations, was recently given a clean chit by the Central Bureau of Investigation and the finance ministry. During his stint at SBI, Bhatt had locked horns with RBI on teaser loans, a home loan scheme that offered lower interest rates in the first few years, and later on provisioning norms, resulting in his gradual alienation from the finance ministry then headed by Pranab Mukherjee. Soon after Bhatt left, SBI reported a 99% fall in profit in the quarter to March 2011, which was blamed on higher provisioning. The bank had then set aside 500 crore on outstanding teaser home loans on the directions of RBI. SBI had to eventually discontinue the teaser loan scheme. “Bhatt was in SBI and not SBI himself,” Pratip Chaudhuri, the current chairman of the bank had said justifying the decision. Some finance ministry officials say Bhatt’s vast experience could have been utilized better by the government after his retirement from SBI. “There are so many issues such as bank capitalisation, new licences, financial inclusion. In fact, he could have provided more teeth to the spate of circulars that the ministry issued,” one of these officials said.